I make very few fishing trips a year outside of Maryland, yet I always make one that completely takes me out of my comfort zone. Bonefishing, especially self guided week long trips, can test instincts, casting and patience. My recent trip to North Caicos had the normal hurdles of winter tropical trips; a day or two of fishing lost to 30 knot winds, hours of searching flats, and intense moments. I had to deal with curious lemon sharks on numerous occasions and paddled countless miles in an ocean kayak across a lagoon to a ankle-knee deep, twenty square mile flat. I was fortunate to have days of less than five knot winds, catch some fish, and see schools of up to sixty bonefish fish along with a few eight pound loners. Essential gear lists for the tropical flats destined angler may seem daunting for first timers. Bonefishing doesn’t require the angler be burdened with a vest, numerous fly patterns and gizmos. I’ll highlight a few of my favorite items and essential rod, reel and line suggestions. Long Sleeved Flats Shirts- Cloudveil Cool Shirts are UVA and UVB rated fabrics, which are important to reduce exposure to the sun’s rays. The pockets provide storage and the fabric breaths so well that wearing long sleeves on hot days is never an issue. Flats Booties- I have the Chotas. 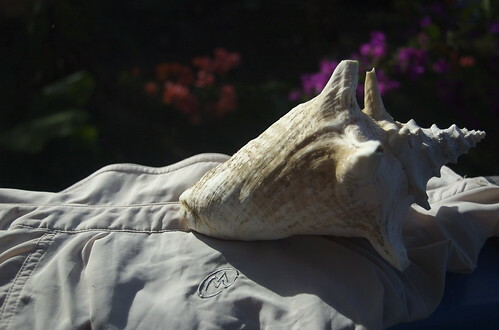 Protective footwear is a must in areas where coral, sea urchins and stingrays are found. Rods- Bring a fast action rod like the Sage Z-Axis Fly Rod in a eight or nine weight for the windy days or bigger fish. When faced with days of 15 knot winds with slightly increased breezes, this rod had the power to send the line on its way. I bring a softer eight weight like the Scott X2S, for days of no wind or when you want a rod to that loads at shorter distances with less effort. 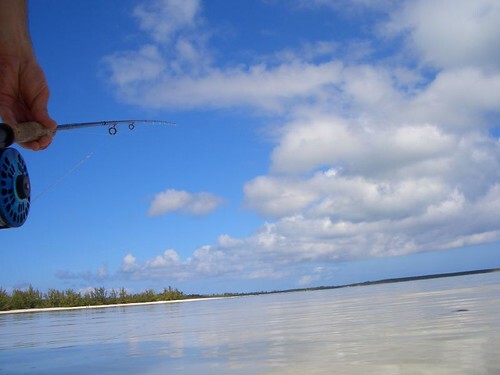 Reels- Bonefish pull hard, make sudden runs, and many fish are lost if the drag is set too tight or not tight enough. Good reels include Abel, Bauer and Lamson. I use an Abel Super 7 on my eight weight rod and a Bauer MX5 on my nine. The best tropical fly line is one I have used the past three years. The Joan Wulff Bermuda Triangle Taper fly line has a heavy, stiff head and the two toned line makes it easy to see where the shooting head ends and running line begins. This line loads the fastest rods, helps casting in the wind, and should increase distance for most casters. In bonefishing one theme that holds true is the need for less gear, but better quality gear. The wind, longer casts and bonefish running drag are normal conditions which anglers need to be able to handle. Appropriate gear should be on the top of the list when months of planning and hours of travel are involved. This entry was posted in gear, reviews on February 11, 2008 by Jason du Pont.